Around 1889, De La Rue, who held the contract for printing postage stamps, were requested by the Postmaster General to investigate printing advertisements for Pears’ Soap on the backs of stamps. 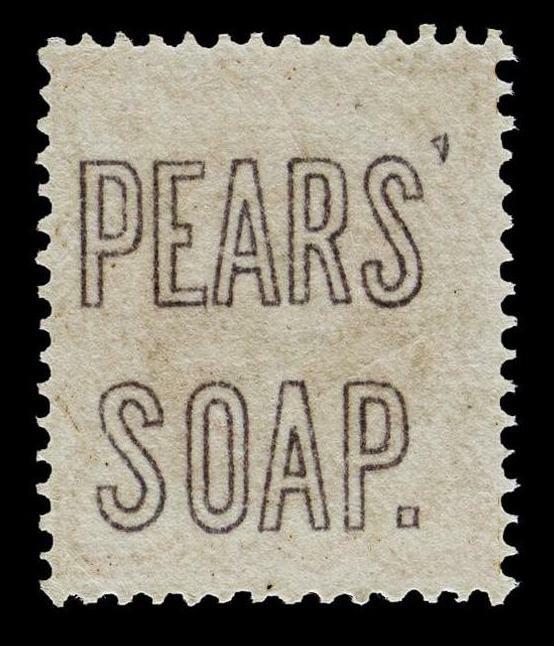 As a trial, they printed the words “PEARS’ SOAP”, in double-lined capitals, in mauve, under the gum, on the backs of the 1881 1d lilac and the 1887 Jubilee ½d vermilion. The records show De La Rue reported difficulties with the task and the Postmaster General never proceeded with the idea. However, Pears appear not to have accepted that all was lost and they themselves conducted their own trials. Examples are recorded with “PEARS’ SOAP” in the same double-lined capitals, in orange, blue and mauve, but this time printed on top of the gum. 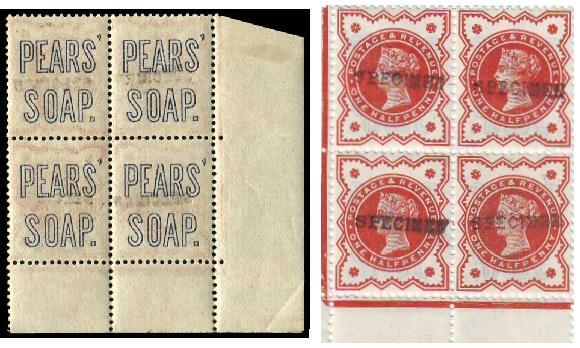 A further overprint, “USE PEARS SOAP”, in red solid capitals has been recorded on both stamps, but W. A. Wiseman, in his 1984 book “The De La Rue Years, 1878 – 1910”, labels them as fakes. A 1d lilac with this, which had a David Brandon 1978 certificate of authenticity, was auctioned by Warwick and Warwick in their July 2nd 2008 sale, but it failed to sell. Wiseman argues that as the solid overprint has so far only been recorded on used stamps then there is no evidence that they were printed by De La Rue before or after being gummed as is the case with the “PEARS’ SOAP” underprint. 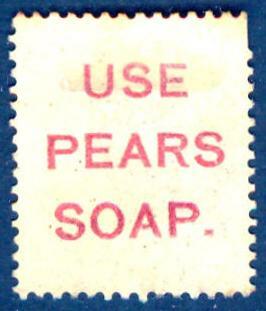 See here for a record of all the USE PEARS SOAP underprints known to me. 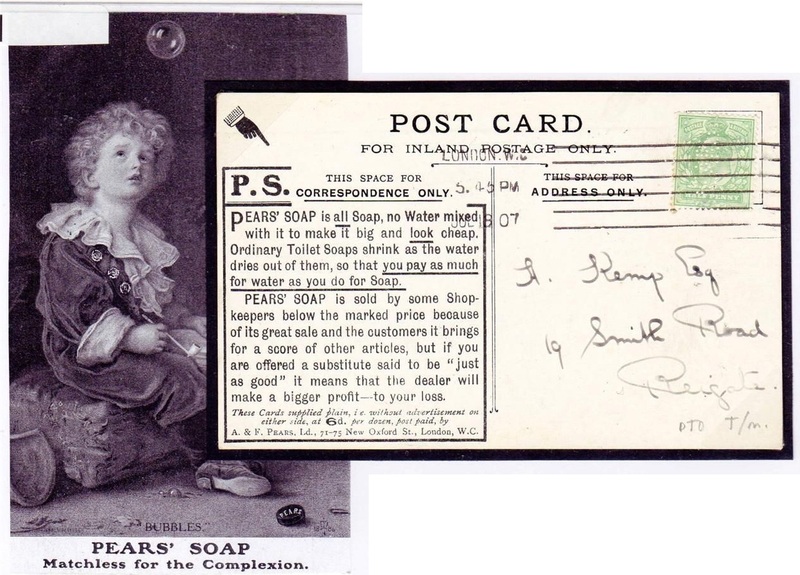 This was obviously a period of experimentation, trial and error on the parts of the Post Office, De La Rue and Pear’s Soap, the motivation coming strongly from Thomas J. Barratt, and one should not be surprised at finding all manner of strange items. Indeed, the 1d. lilac is known with One Penny overprinted on the reverse and the ½d vermilion with Half- / Penny on the reverse, both printed under the gum. These are not mentioned in the De La Rue records, but they are believed to be something to do with the Pears’ Soap experiment. 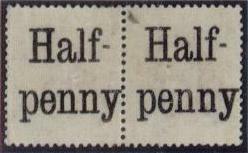 Mint pair with “HALF-PENNY” in black on the reverse, each stamp with a pinhole, few other imperfections. Whatever the case, Thomas J. Barratt was obviously a keen experimenter as far as promoting Pears’ Soap brand (in fact according to Unilever records, Pears’ Soap was the world’s first registered brand and is therefore the world’s oldest continuously existing brand). This included (but was of course not at all limited to) using French coins imported to the UK countermarked with “Pears Soap”, which were generally accepted as pennies in Britain due to being the same size and shape as the British pennies.